Jones Falls is a real hidden gem. And it doesn’t appear to get that busy either…at least it wasn’t busy when I was there! 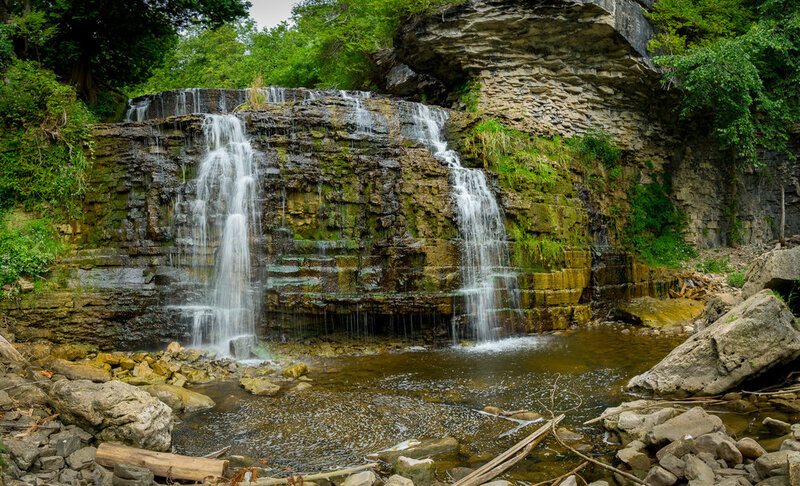 Jones Falls is located inside the Pottawatomi Conservation Area, just minutes outside Owen Sound. The parking area can be found off of Highway 6, just north of Highway 21 (10th Street W). The trail to get to the waterfalls starts from the parking lot and goes through a forested area. The hike is quite an easy one, but the trail is a little bit rocky in some areas, and there are exposed tree roots. After a rainfall, I imagine it would be a bit slippery and muddy. It’s a fairly quick hike to the waterfall area, being appx. 400m from the parking area. The trail also follows alongside the Pottawatomi River so in some areas, the trail will bring you steps away from the river. As you get closer to the waterfalls, you’ll come across a fork in the trail. Taking the fork to the right and then crossing over the footbridge, you’ll reach the lookout to the falls from the top of the escarpment. The lookout is nestled among the trees and gives a nice birds-eye view overlooking the falls. If you take the fork to the left, you’ll come across a side-trail on the right side of the trail which will lead you down to the bottom of the falls. The side-trail is easy to miss, so you’ll need to keep your eyes peeled for it. The side-trail opening is located just after you pass a rock wall. This rock wall is actually the start of the side-trail to the bottom, with the side-trail passing through a cut-out path in this rock wall. There was a wooden sign on one of the trees by the opening too, but it didn’t look like the typical trail signs or markings so not sure if it’s something permanently there or not. The path through the rock wall is a bit steep, but it’s a fairly short climb down to the bottom. Then, it’s a short and easy walk right up to the falls. The footing to the falls is rocky though and there are many loose rocks along the way, as you would expect to find along a riverbed. The time of year may determine how close to the falls you can get. Typically, the water levels are lower in the late summer, so you can get a lot closer as the waterfalls are not as full as usual. The photos I posted are from August 2016, which really shows the low water levels.